Today we have launched a new “resources” page to our blog. Here, you can access an ever-growing assortment of reading material for those interested in learning more about RELIANCE and the Herreshoff family. Many of the books can be purchased through our Museum store, which can be accessed by clicking on the titles. Let us know if you have any titles that should be added to our list. Thank you! This entry was posted in Builder's Notes & Pictures and tagged Bristol, Herreshoff, RELIANCE, Roger Williams University on July 16, 2013 by Herreshoff Marine Museum/America's Cup Hall of Fame. Following the completion of the bowsprit section mentioned in the last post, we began exploring other ideas to show the massive size of RELIANCE. We came up with a particularly interesting idea, and began bringing it to life. For hours on end, Herreshoff volunteers could be seen with spray cans, painting the floor of Building 28. Soon, long lines were painted on the floor, but for what exactly? Three distinct lines can be seen, each representing a true scale shadow of a different portion of RELIANCE. 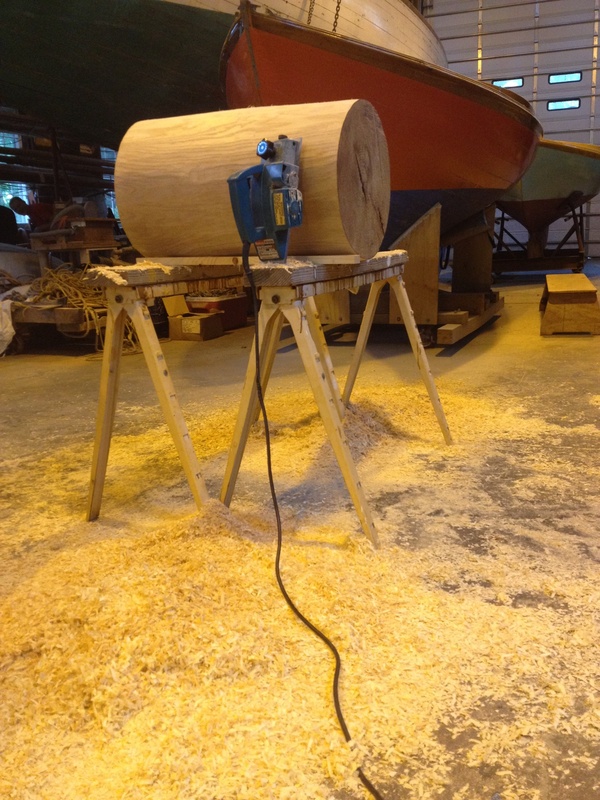 Accompanying the wooden section cut of the bowsprit is a shadow of the full 41-foot, 14 inch diameter bowsprit. Alongside this piece is a shadow of the full 115-foot, 21 inch diameter boom, and the 112-foot 6-inch, 26 inch diameter mast. To look at these artifacts laid out on the floor, it becomes clear how large RELIANCE was. Even looking at it now, I still cannot believe the sheer size of RELIANCE, and the incredible length and diameter of her spars. If you would like to see the work for yourself, the best days to visit Building 28 are Tuesday, Thursday, and Saturday from 9am until 4pm. You can also check in at the Museum store on other days to see if the Building is available for viewing. So make your way down to Building 28 to see all of the work as it happens! The shadow of the bowsprit is laid out in front of the model with the section cut showing a three-dimensional representation of the 41-foot shadow. 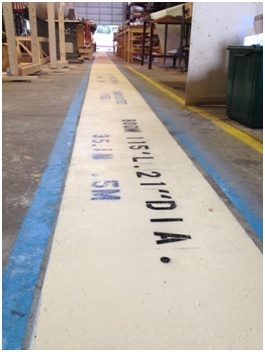 The shadow of the 21-inch boom is in white, while the shadow of the 26-inch mast is blue. At 115-feet, this artifact spans the entire length of Building 28, plus some! This entry was posted in Builder's Notes & Pictures and tagged America's Cup, bowsprit, Herreshoff, mast, RELIANCE, spar on July 16, 2013 by Herreshoff Marine Museum/America's Cup Hall of Fame. Welcome back everyone! Sorry about the lack of posts recently, the Fourth of July is an extremely busy time for the Museum as well as the town of Bristol as a whole. I would like to begin by introducing myself. My name is Aaron Towers, and I am interning at the Museum for the summer. I am working on the RELIANCE project, and will be updating you with the progress of the project as well as any information I feel should be forwarded to you. For the past couple weeks, we have been working in Building 28 to show visitors the true size of RELIANCE compared to our 1/6th scale model. It began when we constructed a 14-inch diameter section cut out to show the actual size of the bowsprit used on RELIANCE. This section represents a piece of RELIANCE’s 41-foot bowsprit. We have also been working on a few more ideas to display the sheer size of RELIANCE in comparison to our model. Keep checking in to see what we do next! Our section cut of RELIANCE’s 41-foot bowsprit. 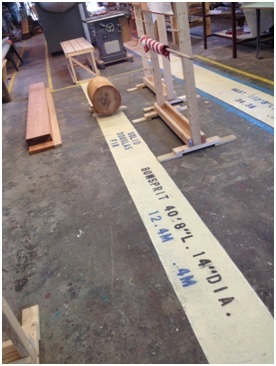 This entry was posted in Builder's Notes & Pictures and tagged bowsprit, Bristol, Herreshoff, RELIANCE on July 11, 2013 by Herreshoff Marine Museum/America's Cup Hall of Fame.